Miss World Philippines 2017 is all set for its coronation tonight, September 3 at MOA Arena. While beauty pageant experts, enthusiasts reveal their top choices, it is still unclear who among the 35 delegates will be crowned. Aside from the Miss World Philippines title, the committee will also be awarding Miss ECO Philippines, Reina Hispanoamericana Filipinas, and Miss Multinational. WinWyn Marquez has technically become the leading candidate in Miss World Philippines 2017 leaderboard, which means she has a good chance of making it to the Top 5. Teresita was one of the finalists at Talent, Beach Beauty, Top Model, and Multimedia. Winwyn has the highest chance of winning the Miss World Philippines 2017 crown. But of course, the ranking will change depending on how contestants answer their final questions. Also joining the Top list are Laura Lehman, Sheila Marie Reyes, Shawntel Cruz, Jona Sweett, Ella Eiveren Lubag, and Jeanyfer Ozbot. 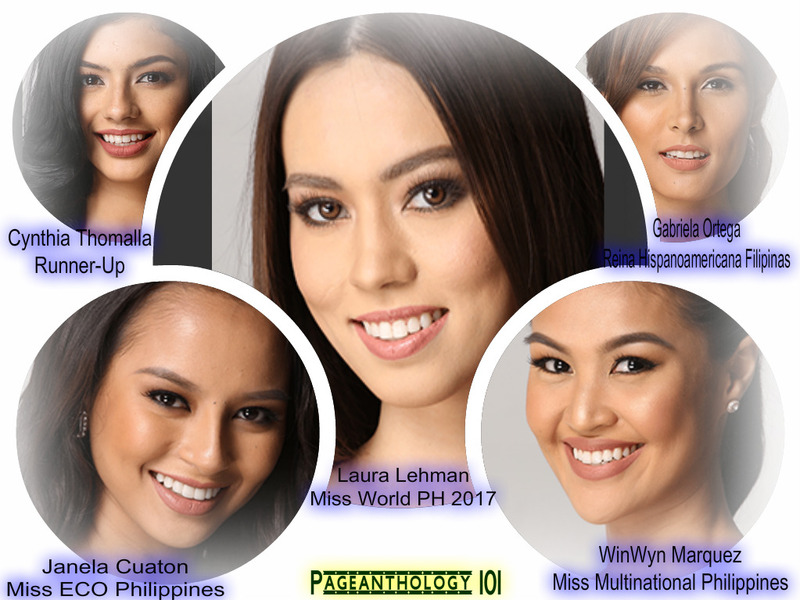 As Winwyn takes the lead in the Miss World Philippines 2017 competition, she did not top the list in Pageanthology 101's choices for the coveted title. Laura Lehman has topped Pageanthology 101's hot picks. Check below to see who Pageanthology 101's experts think will walk away with biggest crowns in 2017. All 35 candidates, of course, have all the chances of making it in the top 10 final list and also winning the crown. For Reina Hispanoamericana Filipinas title, we cannot see any other candidates who are well-qualified for the title other than Gabriela Ortega. 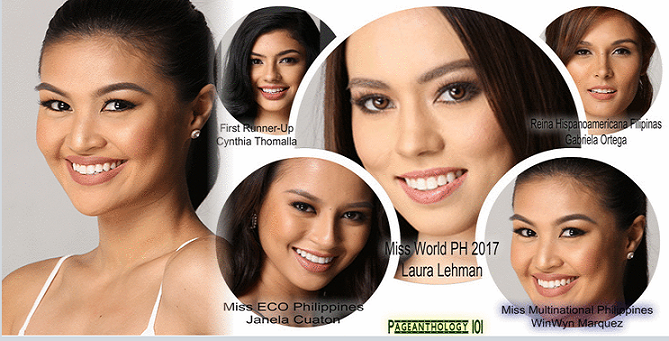 But still, only four ( WinWyn Marquez, Laura Lehman, Cynthia Thomalla and Janela Cuaton) out of those 35 ladies might come out on top in the first rounds of the competition tonight for Miss World Philippines 2017 title.